Evidence-based historical accounts of critical events, which shaped nuclear medicine in India today, are presented in this article. There was parallel activity happening in the northern and western region of India in the early 60s. Radiation Medicine Center (RMC) at Mumbai inaugurated in September 1963 by Dr. Bhabha; and Institute of Nuclear Medicine and Allied Sciences, Delhi dedicated to the nation in February 1964. The isotope division of Bhabha Atomic Research Center endured as the backbone in the supply of indigenously produced medical radioisotopes in research reactors APSARA (1958) and CIRUS (1960). Design and dispatch of economical generators (loaded with low specific activity 99Mo) with indigenously designed solvent extraction (Methyl Ethyl Ketone) technique had led to rapid growth of nuclear medicine facilities in the country. As per recently released list (July 2018) of the Atomic Energy Regulatory Board, there are 293 nuclear medicine departments in the country. Of which 14&! #37; are in the government sector, and the remaining 86% are under private ownership. There are currently 233 functioning gamma cameras (Single-photon emission computed tomography [SPECT]/SPECT–computed tomography [CT]) units in India since 1969 when the first gamma camera was commissioned at RMC. The first medical cyclotron (2002) and first positron emission tomography (PET) (2002) and first PET-CT (2004) in Mumbai had triggered revolution of molecular imaging in India. There are 222 PET-CT, 3 PET-magnetic resonance imaging scanners, and 19 cyclotrons operating currently. India has witnessed relatively slower headways in terms of high dose radionuclide therapy facilities. After first indoor facility at RMC in 1964, only 92 radionuclide therapy (isolation) wards have come up with no more than 200 beds for the entire country in the last 54 years. India started Delhi university approved structured postgraduate diploma in nuclear medicine in 1963 at the Institute of Nuclear Medicine and Allied Sciences (INMAS), first of its kind course in the world at that time. RMC started Mumbai University recognized diploma courses for physicians (Diploma in Radiation Medicine) and technologists (Diploma in Medical Radioisotope Techniques) in 1973. National Board of Examination (Government of India) recognized nuclear medicine as a broad specialty in 1982 and accredited RMC for training for Diplomate of National Board. Doctor of Medicine (MD) started first time in India and Asia at Sanjay Gandhi Postgraduate Institute, Lucknow in 1990. Doctorate of Therapeutic Nuclear Medicine commenced at All India Institute of Medical Sciences Delhi in 2015. There are 18 teaching hospitals currently imparting MD/DNB nuclear medicine residency for physicians with annual intake of 50. Eighteen institutions are offering bachelors and masters programs for nuclear medicine technology with an average annual intake of 110–120 students. Society of Nuclear Medicine, India (SNMI) is the oldest and largest professional body with total life membership of 1425 nuclear medicine professionals. SNMI was established in 1967 and hosted the first Annual Conference at RMC, Mumbai in 1968. Since then, SNMI is organizing its Annual Conferences in various parts of the country with the objective of scientific exchange and popularizing the modality amongst clinicians. Postgraduate Institute of Medical Education Research is hosting the 50th Annual Conference of SNMI (SNMICON-18) as mark of golden jubilee celebration. Radiation cell, the multi-disciplinary study group was created in 1956 with the objective of biomedical research using radioisotope and medical application of radiation, under the ambit of Ministry of Defense with nod from late Pandit Jawahar Lal Nehru, the Prime Minister of India. In 1958, Field unit of Radiation Cell was established at Safdarjung Hospital, Delhi for clinical services and research. Lt Col. Dr. SK Mazumdar was appointed as the officer-in-charge of Radiation Cell. Shri Krishna Menon (Defense Minister, Government of India), Prof. Kothari and Lt Col. Dr. SK Mazumdar envisaged the idea of constructing Institute of Nuclear Medicine and Allied Sciences (now popularly known as INMAS) under Defense Research and Development Organization. Shri Krishna Menon, Defense Minister of India, laid down the foundation stone of INMAS on the piece of land near the bank of Yamuna river in Delhi on September 3, 1961. The construction of the building was completed in 1963 and nuclear medicine equipment was installed. The INMAS was dedicated to the nation on February 13, 1964 by then Minister of Defense Shri YB Chavan. Contribution from Isotope Division of BARC from the early 60s and later on Board of Radiation and Isotope Technology (BRIT) (since 1989) became the basic fulcrum for the progress and work culture of Nuclear Medicine in India Today. Rectilinear Scanner was first installed at INMAS in 1962–1963. Dr. R. S. Satosker undertook the first thyroid uptake measurement study using Thyroid Probe in 1960 at KEM Hospital, Mumbai. Later, standardization of uptake measurements was done at RMC. RMC mounted thyroid uptake probe in 1965. RMC procured slow rectilinear scanner in 1965, which was replaced by the fast rectilinear scanner in 1969. Dr. Aban M Samuel developed the country's first RIA laboratory at RMC in 1967. RMC has the distinction of acquiring India's first scintillation gamma camera in 1969. Single-photon emission computed tomography (SPECT) gamma camera was added to RMC armamentarium in 1984.,, INMAS was rather late in getting a gamma camera, which became available in 1982. India's first magnetic resonance imaging (MRI) scanner was commissioned at INMAS, Delhi in 1986. In October 2002, the then Prime Minister of India, late Shri Atal Behari Vajpayee inaugurated the country's first medical cyclotron and positron emission tomography (PET) scanner at RMC. India's first dedicated PET-CT scanner was commissioned in the Department of Molecular Imaging of TMH, Mumbai in December 2004. The installation of the first cyclotron (2002) in the basement of annexe building and first PET-CT (2004) at the main building of TMH (2004) acted as a trigger for a virtual revolution of molecular (PET) imaging in the country. As per the recent industry report, 222 PET-CT scanners and 19 cyclotrons have already been installed in India till 2018. There are a total of 293 nuclear medicine departments in India as per the Atomic Energy Regulatory Board's (AERB) recently released list (July 2018). Today, 22 of 29 states (76%) and 3 of 7 union territories (43%) in India have nuclear medicine facility. India estimated to have one PET-CT, one gamma camera and one nuclear medicine department per 5 million population. However, it is an astonishing fact that nuclear medicine was established first in the government institutions, but there are merely 14% of nuclear medicine departments currently functioning in the government sector, may be because primary healthcare has been the priority of government. After installation of the first gamma camera in 1969, <20 cameras existed in 1985, 64 gamma cameras until 1990, which have now grown to 233 in number including SPECT-computed tomography (SPECT-CT) [Table 1]. Dr. RD Lele has the distinction of pioneering nuclear medicine practice in private hospitals in India. He started the first nuclear medicine department at Jaslok Hospital, Mumbai with dual-head rectilinear scanner and multi-probe system for dynamic renal studies in 1974 and upgraded the facility with sequential acquisition of gamma camera (1978), Nuclear Stethoscope (1982), SPECT camera (1988), and the first triple detectors SPECT camera in Asia (outside Japan). Jaslok Hospital became an inspiration for the progress of nuclear medicine in the private sector despite difficulties at the ground. India has a unique peculiarity of having more nuclear medicine units established in the private sector (86%). Apollo-Gleneagles PET Centre, Hyderabad was the first to commission a medical cyclotron, and a PET-CT in the private sector in 2005, subsequent to the first government (DAE) owned facility at RMC (2002) and TMH (2004). Even, the first PET-MRI suite was installed under a private sector (House of Diagnostics/Apollo Hospital) in Delhi in 2013. Two out of three PET-MRIs in India currently belong to private ownership. Lt Col Dr. SK Mazumdar started the 1 year post-graduate Diploma in Radiation Medicine (DRM) in collaboration with the Science and Medical faculties of Delhi University in 1962. This was the first of its kind course in nuclear medicine in the world at that time. Maj Gen. Dr. N Lakshmipathi was the first batch, Dr. AK Basu the 2nd batch of DRM students, who went to become the Director of INMAS and Head of Nuclear Medicine at AIIMS, New Delhi, respectively., RMC was permitted to run 1-year DRM affiliated with Bombay University in 1973. Since 2000, DRM course tenure has been increased up to 2 years as per the MCI recommendation and is now affiliated to the Homi Bhabha National Institute (HBNI), Mumbai., So far, 299 candidates have qualified DRM from RMC and more than 200 DRM candidates have graduated from INMAS. National Board of Examinations (NBE), New Delhi under the Ministry of Health and Family Welfare (Government of India); recognized Nuclear Medicine as broad specialty and accredited RMC in 1982 as the first institution in the country, for post-graduate clinical training (post-DRM) leading onto the award of MNAMS degree (now called as Diplomate of National Board-D. N. B.). Dr. BA Krishna and Dr. Ramchandran Nair are said to be the first batch MNAMS/DNB in Nuclear Medicine. Afterwards, many tertiary care and teaching hospitals such as SGPGI (Lucknow), Jaslok Hospital (Mumbai), AIIMS (New Delhi), Hinduja Hospital, Bombay Hospital, (Mumbai), Postgraduate Institute of Medical Education Research (PGIMER) (Chandigarh), SKIMS (Srinagar) started DNB residency training program for a tenure of 3 years (after medical graduation, MBBS), and a tenure of 2 years (post-DRM). There are at least 8 hospitals currently accredited with NBE [Table 2] for imparting training for DNB (Nuclear Medicine). About 14–16 candidates are selected on the merit, based on All India Entrance Examination. In 1990, Prof. BK Das started (MD Nuclear Medicine) at SGPGI (Lucknow, UP). Dr. Bhagwant Rai Mittal had a rare distinction of becoming the first in India to be awarded MD in Nuclear Medicine in 1992. This was the first of its kind residency program leading onto MD Nuclear Medicine conceived in Asia. 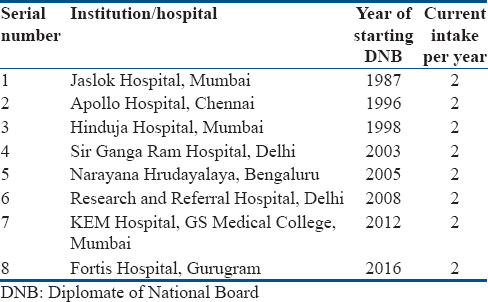 Currently, there are 10 tertiary care teaching hospitals with adequate infra-structure and qualified faculty; engaged in imparting 3 years of residency training program leading to the award of MD (Nuclear Medicine) [Table 3]. Admission to the residency program (MD) is done on the merit list, based on All India Entrance Examinations (PG-NEET). About 50 candidates qualify MD/DNB in nuclear medicine every year. DRM/DNB/MD candidates are eligible to act as Radiation Safety Officer in nuclear medicine facility after qualifying RSO Certificate Examination conducted by AERB. SGPGI (Lucknow) and PGIMER (Chandigarh) have post-doctoral fellowships in various sub-specialties of Nuclear Medicine (Nephro-urology, Nuclear Cardiology, Hybrid Imaging). All India Institute of Medical Sciences, New Delhi has commenced Doctorate of Medicine in Therapeutic Nuclear Medicine (post-MD in nuclear medicine) in 2015 under the mentorship of Prof CS Bal. RMC took the lead in the training of nuclear medicine technologists. In 1973, RMC started 1 year postgraduate Diploma in Medical Radioisotope Techniques (DMRIT) recognized by Mumbai University (currently by HBNI) along with DRM course meant for physicians. Students of both the clinical and technical streams have been trained and tutored together in class, camera room and radio-pharmacy., So far, 309 science graduates and postgraduates have qualified DMRIT from RMC in the last 45 years. Currently, there are 18 medical institutions and hospitals (affiliated to universities) in India, which are offering nuclear medicine technology courses incorporating 50–60 seats for a bachelor's degree, 60–70 seats for postgraduate diploma (DMRIT/DFIT/PGDNMT) and master's degree program (total annual intake of 110–120 students). These courses are in line with the requirements of AERB and the passed out candidates are eligible to work as a nuclear medicine technologist/physicist, and Radiation safety officer in approved nuclear medicine laboratory after qualifying the RSO Certificate examination. From the early 60s, Isotope Division of Bhabha Atomic Research Centre had been involved in the production, purification, and supply of medically desired radioisotopes and radiopharmaceuticals to various hospitals obtainable from APSARA and CIRUS reactors. These consignments involved the long-lived radionuclides (131I, 223Hg, 197Au) and multi-dose formulations of radiopharmaceuticals prepared at the Isotope division. Dr. James Quinn III brought the “era of short-lived radionuclides” by carrying 113Sn-113mIn Generator personally to RMC from Chicago in 1969. Dr. OPD Noronha (9th batch Training School, BARC), a young radio-chemist took the challenge as an opportunity. He and his small team in a small room of RMC familiarized with various aspects of this technology like equilibrium, yield, elution and radiation safety. Dr. Noronha and his team derived in-house local methodologies to label various compounds/ligands with 113mIn for organ-specific imaging after acceptable quality assurance testing. These 113mIn labeled compounds (113mInCl2, 113mIn DTPA, 113mIn Colloid, 113mIn EDTMP) were prepared and dispensed twice a day as a clinical service. This experience and expertise led to the birth of hospital radio-pharmacy practice. RMC became the first and one of two largest hospital radio-pharmacies in India. 113mIn era was soon replaced with advent of 99Mo-99mTc generators in 1971. Isotope Division of BARC indigenously designed this generator loaded with low specific activity 99Mo from CIRUS and Dhruva reactors and devised Solvent Extraction Technique using Methyl Ethyl Ketone for eluting daughter product 99mTc(NaTcO 4). BRIT was constituted in March 1989 as an independent unit of DAE and has taken forward the baton from Isotope group of BARC. BRIT took over the responsibility from Isotope Group (BARC) for production and supply of radionuclides and related products (Cold kits) on the large and commercial scale for nuclear medicine and healthcare. Currently, BRIT has a wide spectrum of products from Column Generator (Coltech), about nineteen ready-to-use cold kits for labeling with 99mTc pertechnetate and radionuclides for therapy (I-131 capsules, I-131 MIBG injection, I-131 Lipoidal for trans-arterial radio-embolization, P-32 and Sm-153 EDMP for bone pain palliation). Brig. Dr. SK Mazumdar pioneered the use of radioactive iodine for the management of hyperthyroidism back in 1959 when he treated ten hyperthyroid patients with 131I at Safdarjung Hospital, Delhi. RMC became the first institution in the country to use radioiodine for the management of thyroid cancer in 1964. It started with establishing modest 2–3 beds in-door facility on the 3rd floor of TMH, which has grown now to the strength of 16 beds. RMC is the largest radionuclide therapy (isolation) ward facility in the country and has accrued one of the largest series in the world of thyroid cancer patients treated with radioiodine.,,, Till September 2018, a total of 14,828 high-dose radioiodine therapies, 2584 Lutetium (Lu-177) DOTATATE (since 2010) and 110 Lutetium (Lu-177) PSMA (since 2017) therapies have been given at RMC. India has witnessed relatively slower headways in terms of high dose (>30 mCi) radionuclide therapy facilities because of logistics constraints and other factors (mandatory requirement of decay tank). After the first ward at RMC in 1964, only 92 radionuclide therapy (isolation) wards have come up with no more than 200 beds in the entire country in the last 54 years. Early in 1966, Dr. R. S. Satoskar convened a meeting of Nuclear Medicine professionals at KEM Hospital, Bombay with an agenda to form a society. The Society of Nuclear Medicine, India (SNMI) was constituted in 1967 with the adoption of formal constitution and registration with Registrar of Societies and charities, Mumbai. Dr. Vikram Sarabhai (Chairman, AEC), Shri H. N. Sethna (Director, BARC) and Dr. A. R. Gopal-Ayengar (Director, Biomedical Group, BARC) consented to be patrons of SNMI. Dr. K. Sundaram was elected as the first President (1969-70) and Brig. Dr. SK Mazumdar as the second President of SNMI (1971-72). Dr. RD Ganatra designed the official logo of SNMI. SNMI started its official scientific publication Indian Journal of Nuclear Medicine in 1986 and Maj. Gen. N Lakshmipathi was the first Editor-in-Chief. Indian College of Nuclear Medicine (ICNM) was conceived as academic wing of SNMI and its first convocation was held in Chandigarh in 1997. Fellowships (FICNM) and memberships (MICNM) of ICNM are conferred onto SNMI members on objective evaluation of credentials. Maj. Gen N Lakshmipathi and Prof AK Padhy were the first Dean and Secretary of ICNM. The first Conference of SNMI was organized at RMC in 1969. The 50th Annual Conference of SNMI (SNMICON-18) is being organized by PGIMER, Chandigarh on November 22nd–25th, 2018 as a mark of the golden jubilee celebrations. In 50th years of existence (1968–2018), SNMI has enrolled 1425 nuclear medicine personnel as life members. With growing number of experts and expansion of the scope of nuclear medicine, other professional bodies have also come into existence. Nuclear Cardiological Society of India (NCSI) was formed in 1996 to promote and popularize this sub-specialty. In India, myocardial perfusion studies are available in about 250 nuclear medicine centers and are performed by nuclear physicians only. The Association of Nuclear Medicine Physicians of India (ANMPI) was founded in 2003 and currently has 248 life members. The nuclear medicine physicist assembled under the banner of Nuclear Medicine Physicists Association of India (NMPAI) in 2007, which have about 300 nuclear medicine technologists/physicist as its active members. ANMPI, NMPAI organize their academic meeting annually while the NCSI is conventionally hosting biennially. Majority of nuclear medicine physicians, physicists, technologists and scientists are life members of the parent body (SNMI). I wish to sincerely thank Dr. Aban M Samuel (my teacher), Dr. Pankaj Tandon (AERB), Dr. Ramesh Asopa (RMC), Dr. Subhash Kheruka (SGPGI), Ms. Shimja (AERB) for their valuable inputs and Ms Palak Sharma (my daughter) for editing the article. Samuel AM. Milestones in the growth of Radiation Medicine Center over past 25 years. IAEA Collection; 1989. p. 1-8. Available from: http://www.iaea.org/inis/collection/NCLCollectionStore/_Public/21/019/21019464.pdf. [Last retrieved on 2018 Oct 22]. Iya VK. The industrial production of tracers for use in nuclear medicine in India. Current Status and Future Prospects. Radiat Phys Chem 1986;28:245-49. Nagaratnam A. Activities and achievements of INMAS. Def Sci J 1990;40:325-34. Radioisotopes and Radiation in Healthcare. Ensuring Better Healthcare for the Nation. Available from: http://www.dae.nic.in/writereaddata/publ/saga/vol3/pdf3/02vol3pdf. [Last retrieved on 2018 Oct 20]. DaCosta H. Lest we forget. RMC Golden Jubilee Memoirs. BRNS Theme Meeting- Pioneering Nuclear Medicine in India; 2013. p. 17-27. Samuel AM. Evolution of radiation medicine centre – From infancy to middle age. RMC Golden Jubilee Memoirs. BRNS Theme Meeting- Pioneering Nuclear Medicine in India; 2013; p. 23-30. Samuel AM. 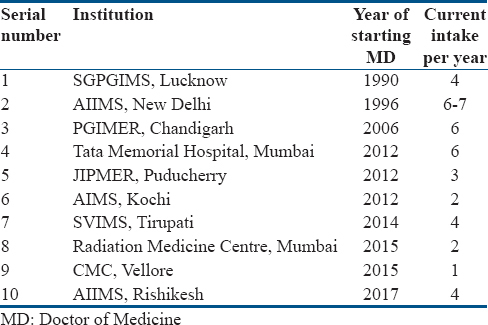 Growth of nuclear medicine in India. Def Sci J 1990;40:335-46. Rangrajan V, Purandare NC, Sharma AR, Shah S. PET-CT – Current status in India. Indian J Radiol Imaging 2008;18:290-4. Nayak UN. Research, Development and Technology Growth at RMC. RMC Golden Jubilee Memoirs. BRNS Theme Meeting- Pioneering Nuclear Medicine in India; 2013. p. 70-7. Lele RD. Nuclear medicine in India. Def Sci J 1990;40:347-50. Kumaresan K. Low cost gamma camera? – The ECIL alternative. Indian J Nucl Med 1991;6:33-7. Lele VR. Jaslok Hospital & Research Center. Souvenir of Millennium Conference of SNMI; 2000. p. 65-6. Nagaratnam A. Brig SK Mazumdar and INMAS. Def Sci J 1990;40:315-23. Nayak UN. Human resource development at RMC. RMC Golden Jubilee Memoirs. 2013. p. 35-7. DaCosta H, Nayak UN, Rajan MG. Hospital radiopharmacy. RMC Golden Jubilee Memoirs. BRNS Theme Meeting – Pioneering Nuclear Medicine in India; 2013. p. 78-80. Noronha OP. The Hospital Radiopharmacy Programme at RMC. Souvenir of Millennium Conference; 2000. p. 23-7. Samuel AM, Basu S, Asopa R. Radioisotope Therapy at RMC. RMC Golden Jubilee Memoirs. BRNS Theme Meeting – Pioneering Nuclear Medicine in India; 2013. p. 81-5. Lele VR, Soman P. Nuclear cardiology in India and the developing world: Opportunities and challenges! J Nucl Cardiol 2009;16:348-50.